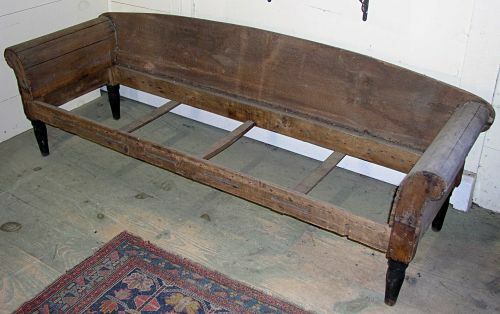 Wonderful country sofa frame with black painted legs 1 piece pit sawn pine backboard along with chestnut frame with holes for rope. Chestnut frame with all pegged construction and rolled arms covered with thin pine hand planed boards.Will have great height once upholstered. Dimensions: Measures overall 84" long X 24" at it`s tallest point X 141/2" tall at front frame.